This immaculate ski-in, ski-out, five bedroom mountain home for sale in Snowmass encompasses every aspect of desired mountain living. 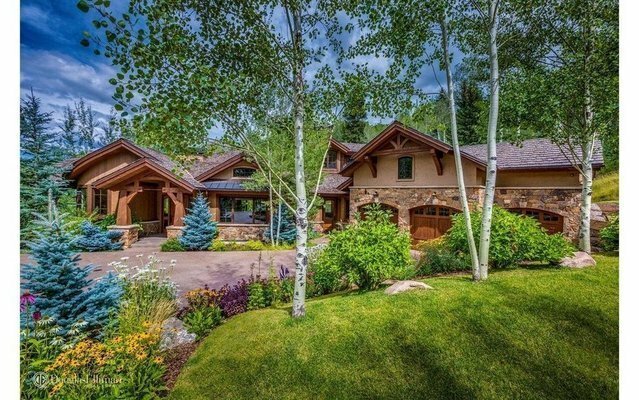 Situated in the prestigious Pines neighborhood just off the Snowmass mountain ski slopes, the home is steps away from summer and winter recreational activities such as hiking, biking, skiing, snowshoeing and cross country terrain. In the winter, take the Pines Trail to the Poma lift and hit the slopes just out your back door. Soak in the views and relax in the outdoor hot tub after long days spent outdoors. Extensive outdoor patio areas make this a perfect entertaining home in both the summer and winter seasons. The home also includes a full bar and wine room, steam showers and outdoor water features.